Take advantage of our wide variety of affordable & convenient units, perfect for all your storage needs. Storage One is an innovative, customer-centered company providing easy access self-storage units in a wide variety of sizes, as well affordable moving supplies and truck rentals in Southeast Michigan. We also offer outdoor storage for RV’s, boats, and commercial equipment. Our convenient locations are secure, well lit, and accessible 7 days a week, 365 days year and are move-in ready with no security deposit required. At Storage One, we aim to always provide full customer satisfaction, starting with the highest quality products and services at the best prices. We know you will appreciate the value, convenience and service we offer. Please note that amenities may vary at each location. "I just wanted to take the time to send out a thank you for taking such good care of our storage needs over the last 4 years! Safe, clean, and convenient are the things that have made Storage One a great choice for our business... but the excellent level of personal service that you have provided makes it an easy choice for me as well." William C.
"We absolutely love working with Storage One! We have a small business and use the storage daily to store and organize our supplies. The owners work with our shipments on a daily basis. They are so flexible and willing to work with us in storing our items that it makes our job much easier! Thank you Storage One!" Rick J. "I have been with Storage One for a year now, it is the wonderful management that keeps me here. The management is so, so wonderful. I’ve needed help more than once and Storage One has always been there for me and was happy to do so." Sandy B. 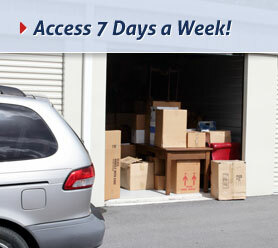 Need to store personal belongings, a boat or RV? Contact us today to learn about our move-in rates and specials.